When I was a child, I saw a version of The Little Mermaid that was not the Disney version that is with me to this day. I love the Disney version, but it is the one I saw first which I think of most frequently. I've wanted to create my own version of Ariel for a long time. 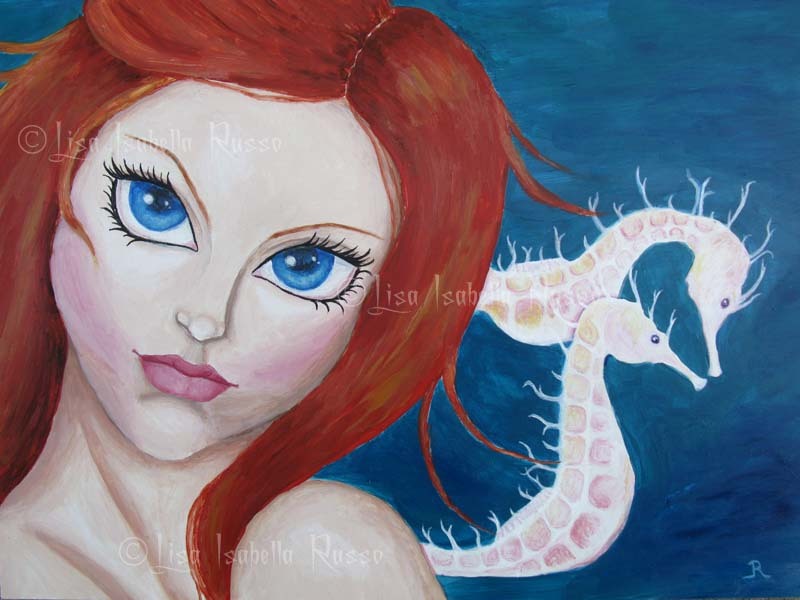 Here she has a slight almost smile as she swims with her seahorse friends... She has big blue eyes and is a redhead. I did a solo study of one of the seahorses here. The art has a surreal lowbrow fantasy feel. The original painting is an 14"x11" acrylic painting on canvas. It is also available as 10"x8" Open Edition giclee prints and as 3.5"x2.5" Limited Edition ACEO giclee prints with some cropping. The ACEO edition is limited to 25. To see the cropped version in advance, please email me.